By completing this form and clicking the 'subscribe to list' button you confirm that you agree to the terms and conditions listed below. Please take the time to read them. You also agree to receive emails on our daycare, boarding, walking and other dog services. You can unsubscribe to the emails at any time. If you require that your dog be let off the lead, the carer requires that you accept full responsibility if your dog runs away or gets lost and by signing this form you agree toyour dog being off the lead unless you instruct us otherwise. 24 hours notice must be given in the event that you wish to cancel walking or daycare otherwise CANCELLATION CHARGES apply. Two months notice is required if for any reason you decide not to board with Doberdayz after booking, failing which your booking deposit is non-returnable,. By signing this form you confirm your dog is non-aggressive, but should it show aggressive tendencies towards the dog carer or staff, or should it’s behaviour become uncontrollable or a nuisance beyond reasonable acceptance, you agree that he/she will be returned home or to agreed accommodation for the duration of your holiday and that this will be subject to a £20 transfer charge. You also agree for the carer to make any decisions regarding your dog’s health providing it is acting in the best interest of your dog and is on the advice of a qualified veterinary surgeon in an emergency. Vet bills that your dog may incur will be met by you. You agree that should your dog bite or fight with another dog whilst in the care of Doberdayz you will be fully responsible for any vets fees which are incurred as a result ofyour dog biting and causing injury to another dog. You agree that should your dog bite any person you accept full responsibility and liability for such incident. By completing this form and clicking the 'subscribe to list' button you confirm that you have your own full third party liability insurance in place to cover your dog in the event of any incident or accident taking place. We have learnt from past experience that our daycare services are not suitable for excessively lively, noisy/anti-social or dog aggressive dogs. If your dog is out of control, boisterous, difficult to manage, pulls hard on the lead, or jumps up at people, then we reserve the right to refuse to walk or take the dog for day care. 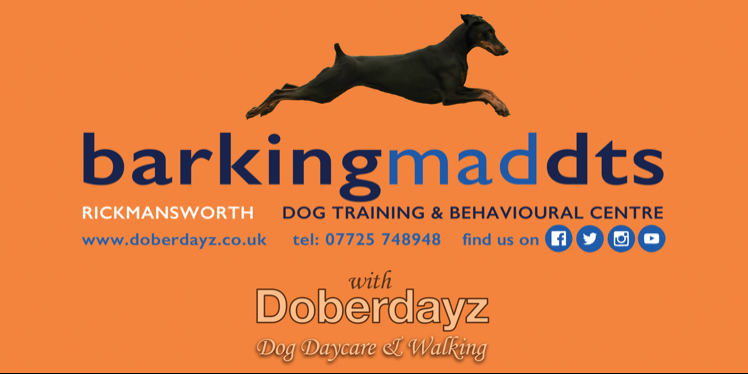 However, if your dog exhibits any of these behaviours Doberdayz is happy to help you with any training issues on a one to one basis initially. Please tell us your dogs feeding schedule? Other information your dogs carer should know?